There are 20 ski resorts between 1400 m (≈ 4600ft) and 2700m (≈ 9000ft) high, and the Orelle resort up to 3200m (≈ 10650ft) giving access to the most beautiful off-pistes of La Maurienne. 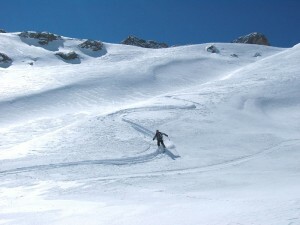 Those wild off-pistes are still poorly known but of an exceptional quality: lots of dales, couloirs and steep slopes where, thanks to the to different techniques, we will ensure your safety. The Maurienne safari skiing allows you to change resort every day, therefore you will enjoy an interesting variety of landscapes far from the big crowded resorts. Those resorts allow people to make significant progress and to reach a high skiing level. Val Fréjus : Grand Vallon couloir, skiing down the slopes toward Italy through the Frejus Valley to eat a pizza! Orelle/Val Thorens : all the off-pistes on the Maurienne side.